April schedule now posted. Please note start times have changed to 830 pm starting April 5th. A tour scheduled every Friday and Saturday night as long as there are a minimum of 6 total guests. Book your reservations today. New contact number (864)517-0688 . Reservations still made on reservation tab. Confirmation is not sent automatically. I usually will respond within 8 hours. Please check your spam as confirmation may show up in that box. We are experienced paranormal investigators telling of current paranormal phenomena routinely experienced by Roswell residents, businesses, and our own tour-goers! Check SCHEDULE page for current schedule of regular tours. Private group tours are also available to suit your desired date and start time! Tour is 2 – 2.5 hrs long, but only covers 1 mile from start to finish. Therefore, it is not a strenuous walk. 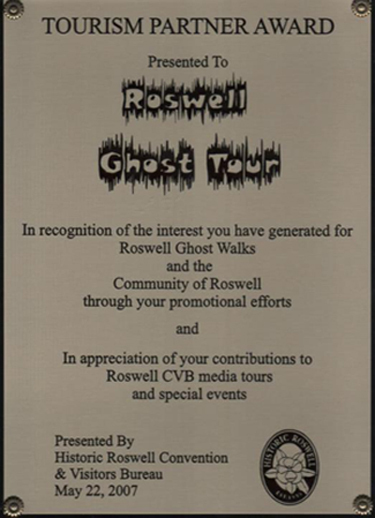 Visit our online STORE to order Roswell Ghost Tour t-shirts and Gift Certificates!! Tours depart from the bandstand in the Roswell town square (across from the Roswell visitor’s center – 617 Atlanta St., Roswell, GA 30075) at the intersection of Highway 120 and Highway 9. We assemble ourselves in the bandstand in the town square 15 minutes before tour start time to begin promptly at the scheduled start time. Our tour also ends in the town square, making parking very convenient. Tour fees: $15 for adults, $10 for children 12 and under, not including guide gratuities, cash only please. Each attendee will be required to sign a liability waiver before we begin. A portion of the proceeds continues to go to various preservation and restoration projects throughout historic Roswell. 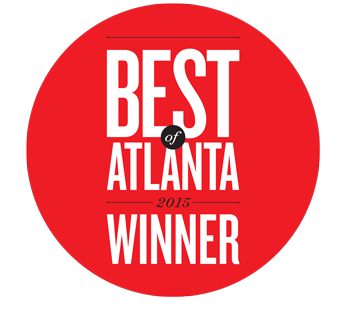 Come to Roswell, GA! Experience the charm and mystery of the deep south through our many ghost stories. 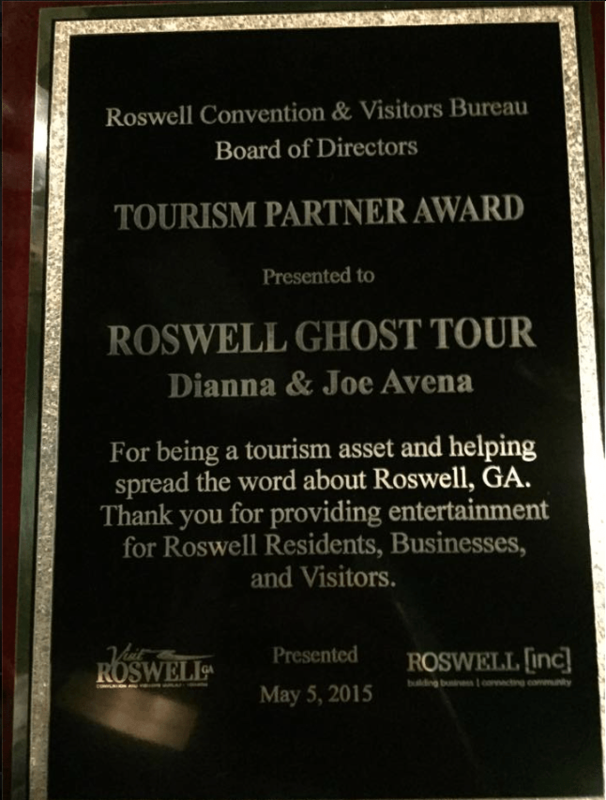 Learn much about Roswell’s deep history from our knowledgeable guides. 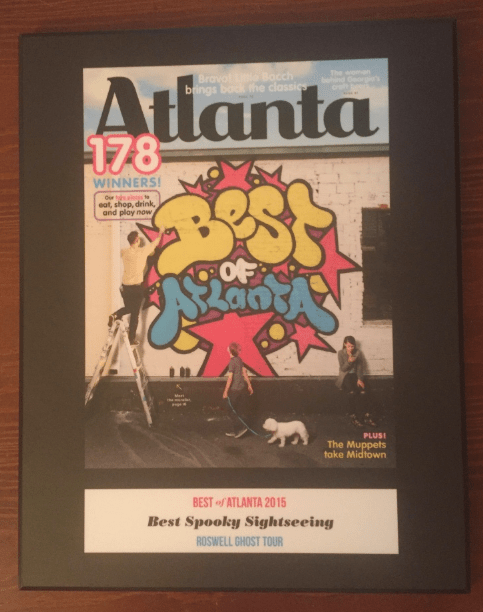 In the heart of this historic village, one will be surprised by how many spirits reside behind the walls of the antebellum mansions which General Sherman never burned. The deep ravines with their ruined mills hold secrets of exiled mill workers whose toilsome moans may still be heard. AVAILABLE NOW! Order your personalized, signed copy of Dianna’s book, “Roswell: History, Haunts and Legends.” Books will also be available at the end of the tours. Just ask your guide about purchasing a signed book. We were featured on an episode of SyFy’s Ghost Hunters! Joe and Dianna Avena were in an episode of Sci-Fi channel’s “Ghost Hunters” in their 5th season! 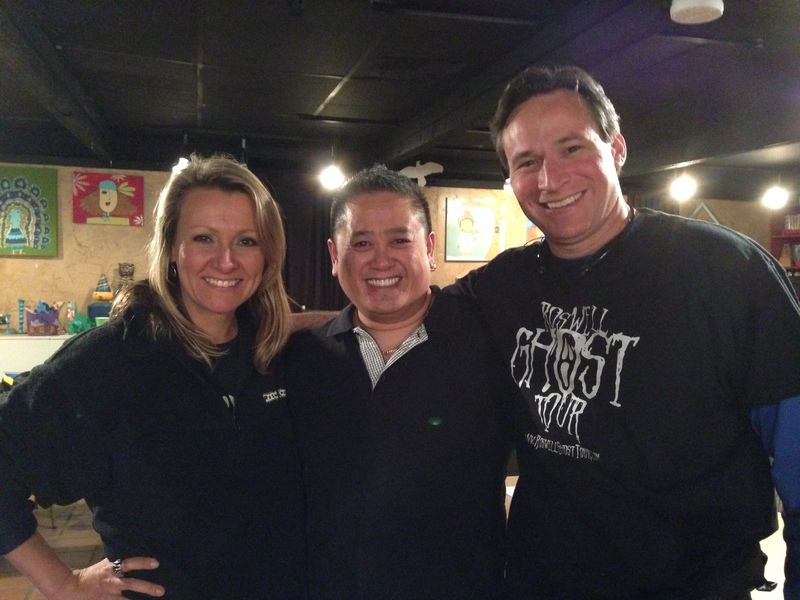 Joe and Dianna were filmed investigating with their friends, the Ghost Hunters team, at 2 Atlanta area locations which aired in April 2009. The episode is entitled “Titanic Terror”. View the entire episode HERE! Good pal and frequent celebrity guest on the Roswell Ghost Tour and special events. Click HERE to read the Foreward that Chip Coffey wrote for Dianna’s book. We will be scheduling more paranormal pals to join us as celebrity guests on the Roswell Ghost Tour! Keep checking back here for details as they come, as well as on our Facebook and Twitter pages! 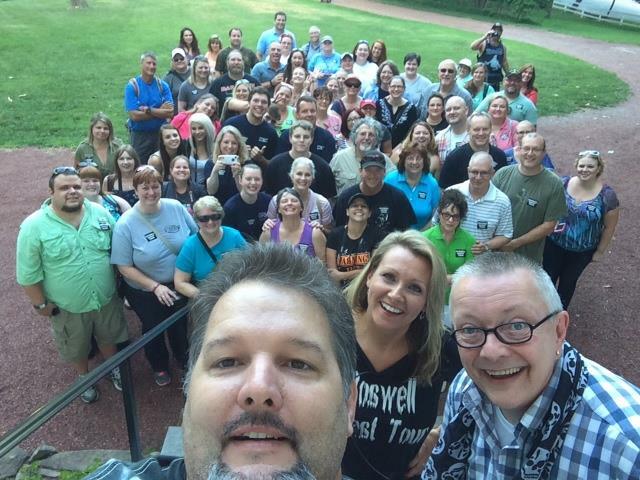 Britt Griffith AND Chip Coffey on the Roswell Ghost Tour, June 28th, 2014 and again on October 3rd, 2014….